This guide contains the key information you need to get started using your Yealink® W56P IP DECT phone with the AT&T CollaborateSM service. You’ll learn how to access features using the buttons, line keys, and soft keys on your Internet Protocol (IP) phone. Collaborate is a Voice over IP (VoIP) system that transports calls over the AT&T IP network rather than over the traditional public switched telephone network. You can use Collaborate exactly as you use a traditional phone system. 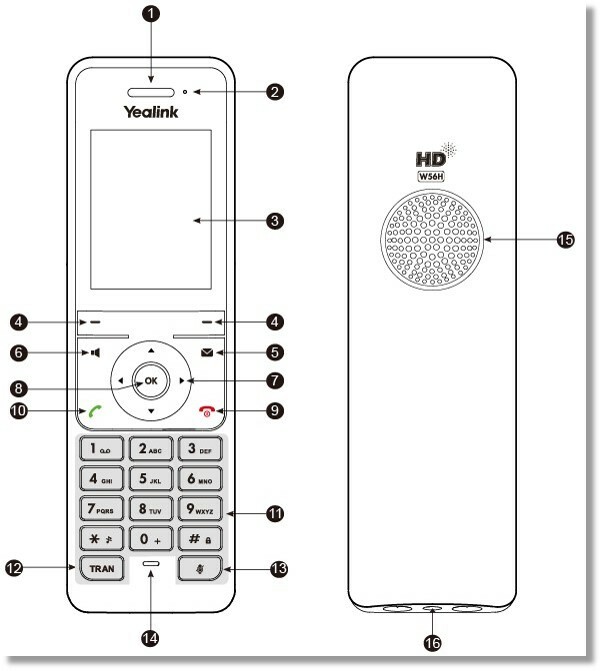 For more detailed information about using this phone, see the Yealink W56P User Guide, available from Yealink. Note that not all Yealink features are available with Collaborate. For your reference, print this page and fill in the important information your administrator provides. Menu screen – Displays the menu icons you can select to access phone features, base settings, information, and more. Calls screen – Displays all active and on-hold calls for your line. This screen appears automatically when you have an active call and 1 or more calls on hold. Idle screen – Displays the time and date, and any soft keys. This screen appears when you’re not using your phone. Your organization determines which Collaborate features you can use and can also impose dialing restrictions. If you have questions about the features available to you or about any dialing restrictions, contact your administrator. With Collaborate, you don’t need to use an out of network prefix (such as 9) when making calls. The W56P IP DECT phone can handle multiple calls at a time. You can have only 1 active call (the call that has audio associated with it) at a time; other calls are placed on hold. Your phone can have up to 5 lines with unique extension numbers, or the same extension number as other lines on your network. Your administrator sets up the lines. Start entering the number you want to call. The phone displays a list of previously placed calls. As you enter numbers, the phone displays similar numbers from your directory. Finish entering the phone number, or select the number from the list. Enter the site prefix plus the extension number. Enter a 10-digit number, a 7-digit number within your own area code, or a special number (such as 411 or 911). Enter 011 (the international code) + country code + phone number. Press the Speakerphone, Off-hook, or Select/OK button. For details, see the AT&T International Dialing Guide at https://www.business.att.com/bt/dial_guide.jsp. Press the Speakerphone, Off-hook/Call, or Select/OK button. – On the Idle screen, press the History soft key. – Press the OK button. On the Menu screen, select the History icon. – Scroll down to the Received Calls log by pressing the down arrow key, and then press the OK soft key or the Select/OK button. To scroll through the list, press the up and down arrow keys. To see the most recent call, press the up-arrow key. To see the oldest call, press the down arrow key. Select a number from the list, and then press the Speakerphone, Off-hook/Call, or Select/OK button. When the handset is idle, press the Off-hook/Call button. The Redial list appears. The last number called is automatically selected at the top of the list. When the handset is idle, press the Off-hook/Call button. The Redial list appears. Scroll through the list and select the number. – To scroll up, press the up arrow key. – To scroll down, press the down arrow key. During an active call, press the Options soft key. Scroll down to Hold by pressing the down arrow key. Press the OK soft key, or press the Select/OK button. If you’re handling just 1 call, press the Resume, Off-hook/Call, or Speakerphone button. – 1 active call, 1 call on hold: Press the up and down arrow keys or the Swap soft key to move between the 2 calls. – 2 calls on hold: Press the up and down arrow keys or the Swap soft key to select 1 of the held calls, and then press the Resume button. The special features of Collaborate described here can save you time. With some features, you press buttons or soft keys. With others, you enter special feature codes (for example, *86) from the phone’s keypad. In some cases, you can access features in multiple ways. For more information about feature codes, see Feature access codes. Manage calls with these special calling features from Collaborate. Calls automatically connect after a few seconds. To connect calls faster, press the Select/OK button. If you call a phone number that’s busy, Auto Call Back Busy checks the busy number for the next 30 minutes. When the phone number becomes free, Auto Call Back Busy rings you and connects the call. You can cancel Auto Call Back Busy at any time, and you can have multiple Auto Call Back Busy sessions running at the same time. Note: If you call a number that has voicemail, you’ll be sent to voicemail and Auto Call Back Busy doesn’t check the number. Make your call. When a number is busy, a voice prompt offers Auto Call Back Busy. When the voice prompt confirms that Auto Call Back Busy is turned on, end the call. When the number you called becomes free, your phone rings. Answer the call to connect to the number you originally called. Enter *86, and then press the Speakerphone, Off-hook/Call, or Select/OK button. If you see a new caller’s ID in your phone’s display window while you’re on a call and you hear a call waiting tone, Call Waiting is turned on and you have an incoming call. If you don’t answer the new call, it will be routed to your voicemail (if available) or to your chosen “when I don’t answer” call treatment. If you don’t want to be notified when callers are waiting, you can turn Call Waiting off for the current call. Enter *70 and the phone number you want to call. Mandatory—For all calls except 911, you’re always prompted and must enter an account code when calling outside your organization. Optional—You can enter a feature access code followed by the account code when calling outside your organization, but it’s not required. When prompted, enter the account code. When Caller ID is turned on, your number and name appear on the phones you call. For a single call outside your organization. Note: Your administrator can block your line’s caller ID for all calls. Enter *67 and the number your want to call. Enter *65 and the number your want to call. Unattended transfer—Transfers your call to the new caller directly and drops you from the call. Attended transfer—Enables you to speak with the person you’re transferring the call to before you transfer the call. If there’s no answer or the person doesn’t want to take the call, you can cancel the transfer and talk with the caller. During a call, press Options, and then select Transfer. Enter the phone number to which the call will be transferred. Press the Transfer soft key. The call is transferred and you’re dropped from the call. − Enter the phone number to which the call will be transferred, and then press the Select/OK button. − Press the Directory soft key, select the Local Directory, use the arrow keys to select the contact you want to call, and then press the Select/OK button or the Call soft key. Wait for the person to answer, and then speak. If the person agrees to accept the call, press the Transfer soft key. The call is transferred from your phone and you’re dropped from the call. If the person isn’t available or doesn’t want to accept the transferred call, press the End soft key to resume the original call. You can conduct a conference call with 3 participants from your phone. After the first person answers, press Options, and then select Conference. This places the call on hold. When the second person answers, press the Conf soft key to establish the conference. To combine an active call and a call on hold into 1 conference call, press Options, and then press the Conf soft key. When you don’t want to be bothered, you can turn on Do Not Disturb. Private lines—If you have voicemail, all incoming calls are immediately routed to your voicemail. If you don’t have voicemail, calls are routed to your “when I’m busy” call treatment. Shared lines—Your phone won’t ring, but the line blinks and you or someone else can answer the call. Select the Call Features icon. Press the down arrow key to find and select Do Not Disturb. Press the up and down arrow keys to select the line you want, and then press the OK button or soft key. Press the left and right arrow keys to select Enabled or Disabled in the Status field. You can initiate an Intercom Over Speakerphone call to other Collaborate users in your organization. The phone of the person you’re calling automatically answers the call in speakerphone mode. You can then have a conversation. Wait to hear a beep, and then speak. If you don’t want to answer a call while it’s ringing, you can reject the call. If you have voicemail, the call is routed to your voicemail. If you don’t have voicemail, the call is routed to your chosen “when I don’t answer” call treatment. Note: If the ringing line is a shared line, your phone will stop ringing but the shared lines will continue to ring on other phones. While your phone is ringing, press the Onhook button. A phone number assigned to a line key on an IP phone is called a line appearance. The line keys on your phone can have repeated numbers, different numbers that belong to you, or numbers that belong to others. When a call comes in to a number, all phones with that number as a line appearance ring at the same time. When the call is answered, how it’s handled depends on the line’s call presence. Shared call presence—When a call is answered and put on hold, any other phone with that line appearance can take the call off hold. Not shared call presence—When a call is answered, it becomes exclusive to the phone that answered it and no longer appears on the other phones. While on a call, press the Swap soft key. The call on the first line is put on hold. Talk with the second caller. To return to the first caller, press the Swap soft key again. The second call is automatically put on hold. You can forward calls to other numbers. The forward-to number can be an extension or any 10-digit phone number. Call Forwarding – Always—All calls to your phone are forwarded. This is also known as Send All Calls. Call Forwarding – No Answer—If you don’t answer, the call is forwarded. Call Forwarding – Busy—Calls that come in while your phone is busy are forwarded. Call Forwarding – Not Reachable—Applies when your phone can’t be reached by the Collaborate network (not simply when you don’t answer or are busy). You can set this up in advance. Note: Your administrator establishes your access to call forwarding features. If you have questions about your access to these features, contact your administrator. Enter the phone number to which calls will be forwarded. Press the Speakerphone, Off-hook/Call, or Select/OK button. A voice prompt confirms that call forwarding is turned on. Press the Speakerphone, Off-hook/Call, or Select/OK button. A voice prompt confirms that call forwarding is turned off.